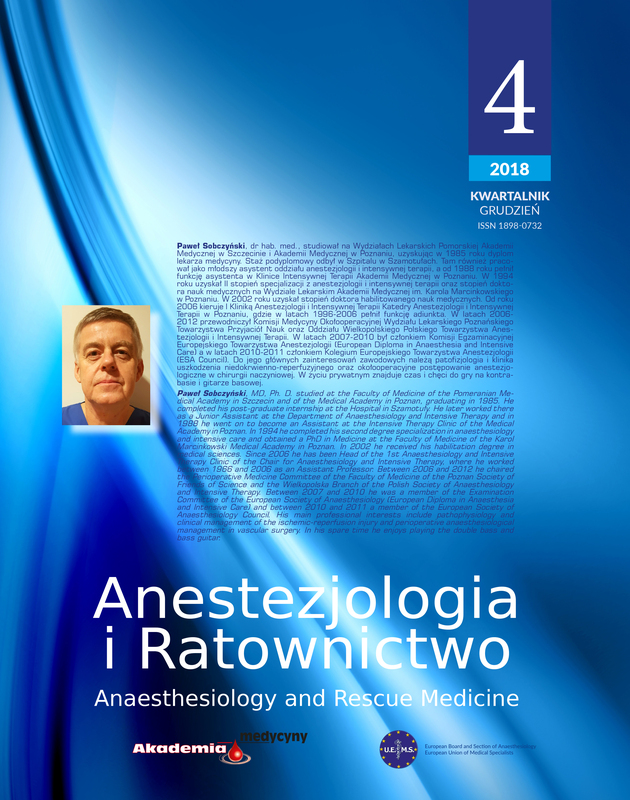 Anestezjologia i Ratownictwo is a peer-reviewed journal which publishes original manuscripts about all aspects of general and regional anaesthesia, intensive therapy, emergency medicine, resuscitation and pain therapy, as well as medical technologies and their applications. At the same time, although the themes addressed by the journal mainly focus on clinical topics, it is also open to research papers on experimental study and basic research related to anaesthesiology and intensive therapy, provided that the authors can demonstrate their relevance for clinical medicine. Anestezjologia i Ratownictwo also publishes review papers ordered by the scientific board from recognized experts in a particular field. The editorial team also accepts other papers, if they are of outstanding scientific and educational quality. The journal also publishes up-to-date recommendations and guidelines developed by scientific societies and their sections concerning anaesthesiology and intensive therapy, pain medicine and resuscitation. The papers are published in Polish and in English. The journal is registered in databases kept by the Ministry of Science and Higher Education (List B – 8 points), Index Copernicus (81.66 points), Polska Bibliografia Lekarska and EBSCO. Anestezjologia i Ratownictwo has been published since 2007 and is released under the prestigious patronage of the European Board and Section of Anaesthesiology(EBA) European Union of Medical Specialists(UEMS).